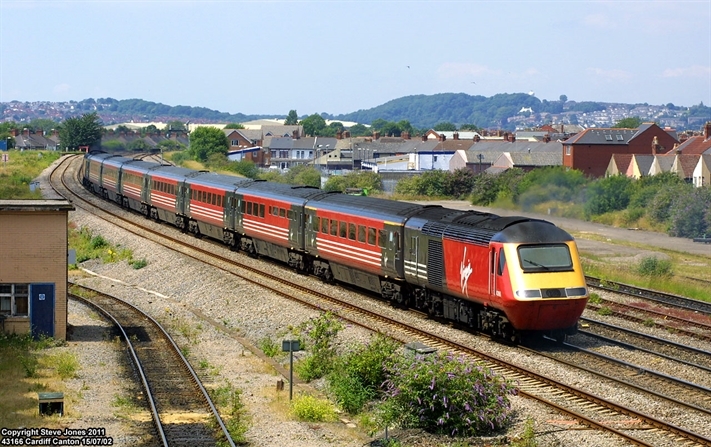 Virgin CrossCountry was a train operating company in the United Kingdom operating the InterCity CrossCountry franchise from January 1997 until November 2007. 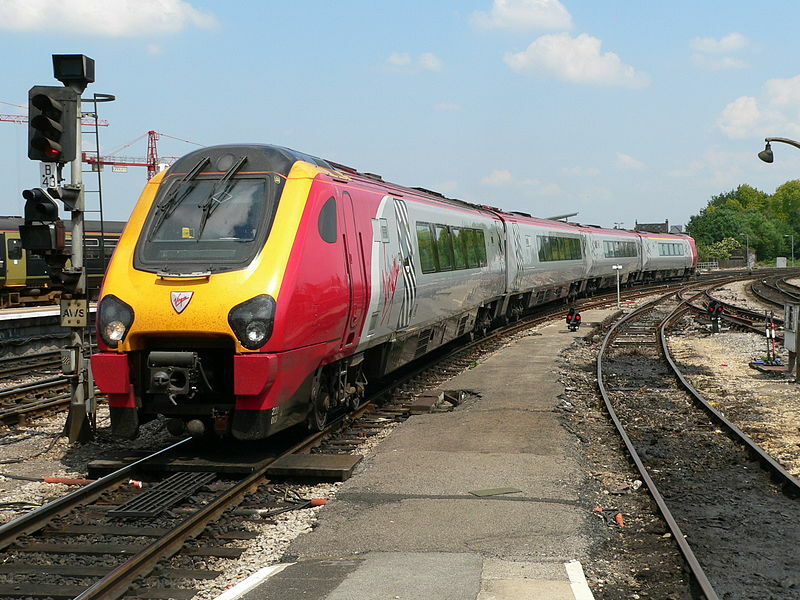 Virgin CrossCountry operated some of the longest direct rail services in the United Kingdom but most avoided Greater London after 2003. All services called or terminated at Birmingham New Street. This franchise, awarded in November 1996, was Virgin's first ever, and was officially launched on January 6, 1997, three months before the West Coast. - 5 Dmu Class 158 with 2 cars (built in 1990). The operation with Mk2 trains, whose services were mainly driven on non-electrified lines, was entrusted to the venerable Class 47 diesel locomotives. Developed between 1962 and 1968, nearly 512 locomotives were built, making it the serie with the most great number of locomotives built. Porterbrook owned a large Class 47/8 fleet, and Virgin then completed the fleet with four EWS class 47/7 machines for his semi-permanent service. In total, and despite a lack of reliability, Virgin leases 28 machines to complete its needs alongside the HST125 trainsets. Class 47 were only needs between 2002 and 2003, the year of gradual withdrawal of this class with the coming of Dmu Voyager and Super Voyager. - 44 trainsets Class 221 reams with four or five tilting cars. A Class 222 was also built but did not concern Virgin. Some of the Class 220 and 221 trains were built at the Bombardier plant in Bruges, Belgium, and others at Wakefield. 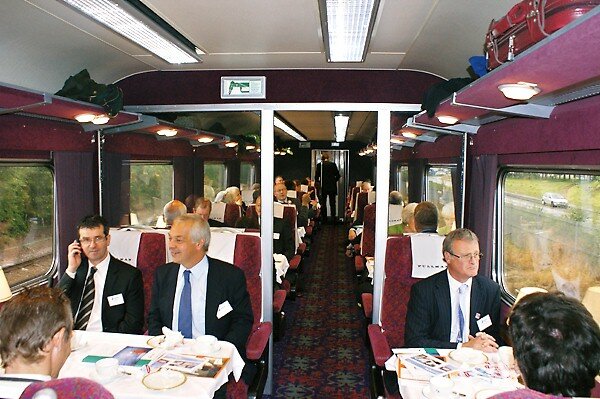 The fact that these trainsets arrived for the new millennium allowed the customers to see that England made a quantumleap of a century, compared to the Mk2 cars... This is the first time in the history of the railway that CrossCountry passengers benefited from a new fleet of trains. 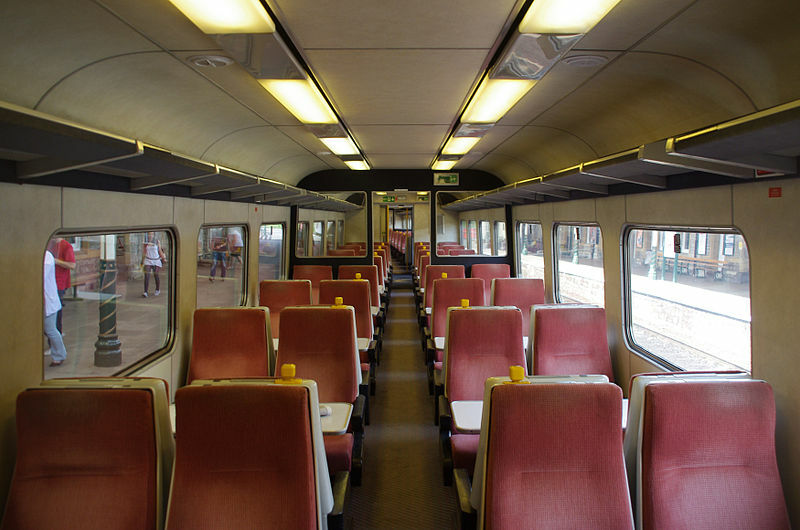 The Voyagers offer indeed many train facilities that have never been seen before in the UK, including digital seat reservations, audio entertainment instead an on-board shop. CrossCountry being a national franchise managed by only one operator, so the new trains were visible across the country from Aberdeen to Penzance. Class 220 are diesel trainsets with 174 standard seats, and 26 seats in first class, ie 200 seats in total. These trainsets were only in operation for the CrossCountry franchise. All units are owned by Lloyds Banking Group's subsidiaries and remain - to date - in maintenance by Bombardier Transportation Service (BTS) at the Central Rivers depot near Burton-on-Trent. 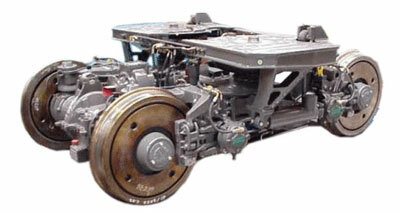 The Dmu 220 were criticized for their small size. Their body design is ovoid to meet the narrower British gauge, but in reality it is identical to the Class 221 designed for tilting. But class 220 don't have this technical possibility that would have required a change of bogie. Another criticism was the noise and vibrations under the floor, which the regulars passengers of the HST don't knew, for at least one reason : on the Voyager Class 220, each car is motorized, not on HST 125. Finally, the choice of four cars could be largely insufficient at certain times on the day or some days of the year, for example during holydays. Line sections where they could reach their maximum speed of 200km / h are very few. Apart from that, the Class 220s produced a considerable qualitative leap on a British network accustomed to antiques. Like the Voyager Class 220, their successors Super Voyager Class 221 enter service on the Birmingham-Reading-Brighton route. The 44 diesel electric trainsets with four or five cars were built in 2002. Unlike the previous vehicles, Class 221 used a new generation of bogies which, at the same top speed of 200 km / h, were lighter than those mounted on the Class 220. This allowed Virgin to pay significantly reduced track costs.  The second innovation is the tilting technology, and we find the same ovoid-shaped body that on the Class 220. 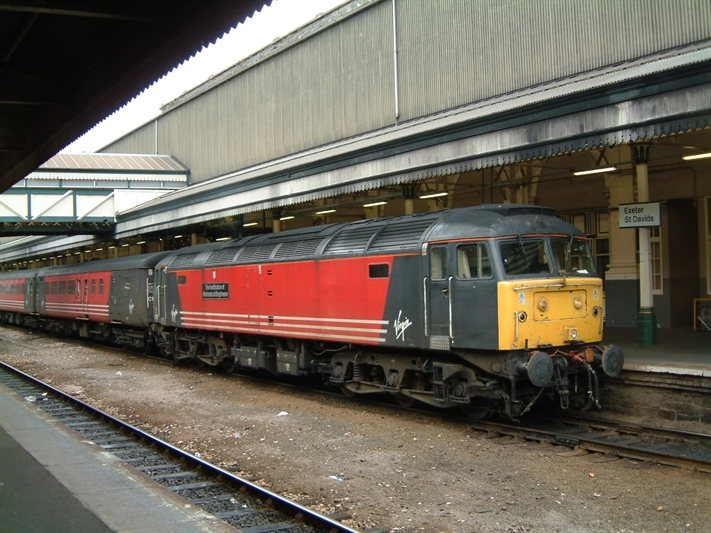 Concerning the 44 Class 221 trainsets, 4 were paid for the benefit of the other franchise, the West Coast, in order to operate the partially non-electrified route between London Euston and Holyhead (port of Wales to join the Ireland by ferry). These trainsets only had four cars instead of five. They were 40 tons heavier than the Class 220 due to their tilting system, and much of the additional weight is located in the bogie which have a different design to accommodate tilt equipment. Both versions are however identical, with components coming from the same suppliers. The hydraulic tilting system originates from those used on Canada's LRC train in the 1970s. Its design was later developed for Amtrak's Acela Express in the United States, and was then chosen as basis system for the Super Voyager. The body tilts up to 6 ° with a maximum of 225mm. 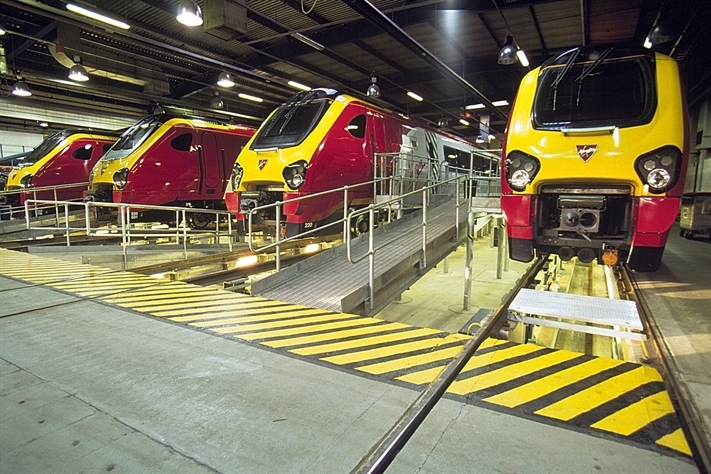 Voyager's first complete train was completed in Belgium in autumn 2000, and arrived in Britain in January 2001 for testing. On May 21 of the same year, a first unplanned service, open to the public, was operated from Birmingham to Reading. The official launch of Voyagers took place on June 5, 2001 by Sir Richard Branson. Virgin CrossCountry - abbreviated as VXC - is the only national railway operating company (TOC). The planning called 'Princess' required four years of negotiations, with seven different Railtrack zones, with 18 other TOCs, with the Strategic Rail Authority (SRA) and with nearly 150 councils in 235 constituencies. Railtrack also spent € 224 million on infrastructure upgrades before launching the new CrossCountry schedule. 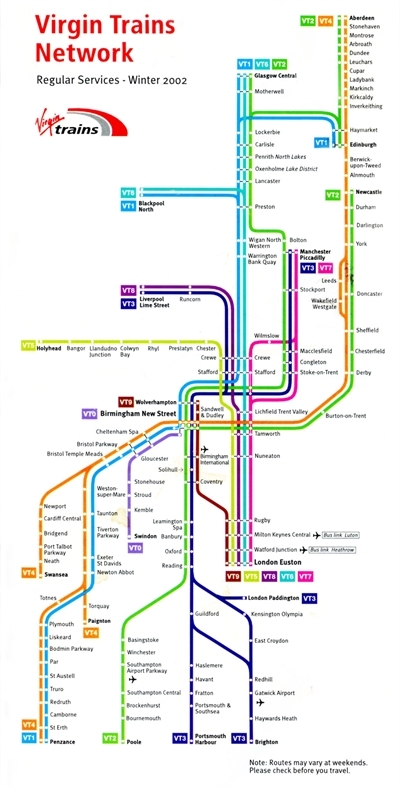 The commercial service itself began on September 30, 2002 to the Birmingham-Reading route, where travel was reduced by more than 20% from 1 hour 50 minutes to 1 hour 27 minutes. The number of trains between Birmingham and Reading increased from 18 to 41 trains a day. The difficult beginnings of the franchise system, theirs short lead times, and the experience acquired drove for a new version of the system in 2007. Franchises were modified, others were created. Despite good assets and renewed rolling stock, the government decided in 2006 to award the Intercity CrossCountry franchise to a new operator, Arriva UK. 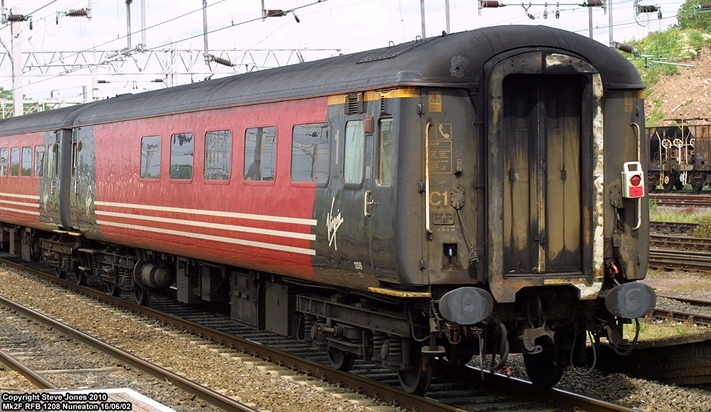 Virgin, however, retained the services between the West Midlands and Scotland, which were then transferred to the West Coast Main Line franchise activities. CrossCountry had to transfer the Manchester-Scotland route for the new TransPennine Express, while conversely, a number of interregional routes from Birmingham were transferred to the new Arriva CrossCountry franchise. Concerning the rolling stock, all Class 220 trains were allocated to the new operator while the 221 trains were divided into two groups: 20 trains for Virgin Trains and 24 trainsets for Arriva UK, maintenance remaining in the Bombardier depot of Central Rivers.